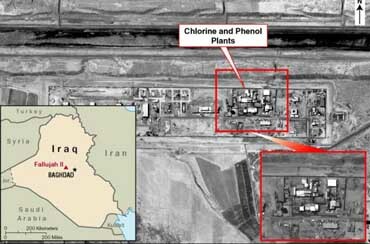 Fallujah II chemical plant. [Source: CIA]In a televised speech, President Bush presents the administration’s case that Saddam Hussein’s regime is a threat to the security of the nation and insists that regime change would improve lifes for Iraqis. “Some worry that a change of leadership in Iraq could create instability and make the situation worse. The situation could hardly get worse, for world security and for the people of Iraq. The lives of Iraqi citizens would improve dramatically if Saddam Hussein were no longer in power, just as the lives of Afghanistan’s citizens improved after the Taliban.” The speech is widely criticized for including false and exaggerated statements. Iraq rebuilding facilities associated with production of biological and chemical weapons - Bush claims that surveillance photos indicate that Iraq “is rebuilding facilities that it had used to produce chemical and biological weapons.” [US President, 10/14/2002] On the following day, photos are published on the White House website showing that Iraq had repaired three sites damaged by US bombs—the Al Furat Manufacturing Facility, the Nassr Engineering Establishment Manufacturing Facility, and Fallujah II. [US President, 10/14/2002] But no evidence is provided by the White House demonstrating that these sites have resumed activities related to the production of weapons of mass destruction. Iraqi authorities will give reporters a tour of the facilities on October 10 (see October 10, 2002). A very senior al-Qaeda leader received medical treatment in Baghdad - Bush claims: “Some al-Qaeda leaders who fled Afghanistan went to Iraq. These include one very senior al-Qaeda leader who received medical treatment in Baghdad this year, and who has been associated with planning for chemical and biological attacks.” The allegation refers to Abu Musab al-Zarqawi, a Jordanian-born Palestinian who is the founder of al-Tawhid, an organization whose aim is to kill Jews and install an Islamic regime in Jordan. It was first leaked to the press by an anonymous US official several days before Bush’s speech (see October 2, 2002). The allegation is partly based on intercepted telephone calls in which al-Zarqawi was overheard calling friends or relatives (see December 2001-Mid-2002). But on the same day as Bush’s speech, Knight Ridder Newspapers reports that according to US intelligence officials, “The intercepts provide no evidence that the suspected terrorist was working with the Iraqi regime or that he was working on a terrorist operation while he was in Iraq.” [Knight Ridder, 10/7/2002; US President, 10/14/2002] Al-Zarqawi will link with al-Qaeda, but only in 2004, after the start of the war in Iraq (see October 17, 2004).